MyPoints Score is a recently released adware-type program that will surely annoy you with constantly appearing ads. But, the ads are not only annoying, but potentially dangerous as well so you should remove this program is order to keep your computer safe. This program can promote websites and programs that can be malicious and compromise your computer’s security. Also, MyPoints Score might gather information about you to tailor the ads in an effort to make them more appealing, and thus, generating more advertising revenue. In short, this program is no good. However, we invite you to read this description that will give you a better understanding about what you are actually dealing with. This program is linked to a website called Mypoints.com that features various coupons that are supposed to give you discounts for various items. However, if you want to claim these coupons you have to sign is using your Facebook or Mypoints.com account. Registering on the aforementioned website requires an email address. So if you register using your email address, you might start receiving annoying spam mail. This website seems to be legitimate and you can buy clothing on it. But we do not recommend trusting MyPoints Score as there is no way of knowing where it might redirect you. While researching this adware we found that it is distributed using a deceptive method known as software bundling. However, it is not deceptive from a legal standpoint provided that the information about the installed software is present. A software bundle does not have to give prior warning about additional software that may be installed automatically. Information about additional software is given in the bundle’s EULA, but this document is often lengthy and difficult to understand even for native speakers of English. We believe MyPoints Score’s installation is hidden inside the software bundle behind “custom” settings. So you can opt out its installation by selecting custom installation settings, but that may not always be the case. Nevertheless, if you want to opt out, you only have to uncheck a certain checkbox and that is it. If you install MyPoints Score on your computer, it will start rendering advertisements in the form of coupons that will appear in your browser’s window on most websites you might visit. It must be noted that many of this program’s ads come from third-party advertisers and MyPoints Score’s developers are not liable for damages that can occur as a result of accessing content via this program. This is clearly stated on Mypoints.com which states “You acknowledge and agree that MyPoints neither endorses the contents of advertisements or third parties' Websites, nor assumes responsibility or liability for the accuracy of material contained therein, or any infringement of third party intellectual property rights arising therefrom, or any fraud or other crime facilitated thereby.” So clearly, this program is not reliable and this quote explicitly indicates that its promoted content might be unreliable. MyPoints Score comes as either a browser extension for Internet Explorer or as a service for Firefox and Chrome. A service program is an executable file (.exe) that runs in the background and renders the ads. If you do not want to see commercial advertisements, you obviously have to remove this program. So we have included a guide that will help you remove MyPoints Score from the aforementioned browsers. Getting rid of programs such as this is vital to keep your computer secure, since adware is often used to spy on its users in order to disclose private information, such as baking credentials. Navigate the mouse to the bottom-left corner of the screen. Locate the adware and click the Remove button. Right-click on the Start menu/Start screen. Locate the application and right-click on it. Simultaneously press the Alt+T keys. 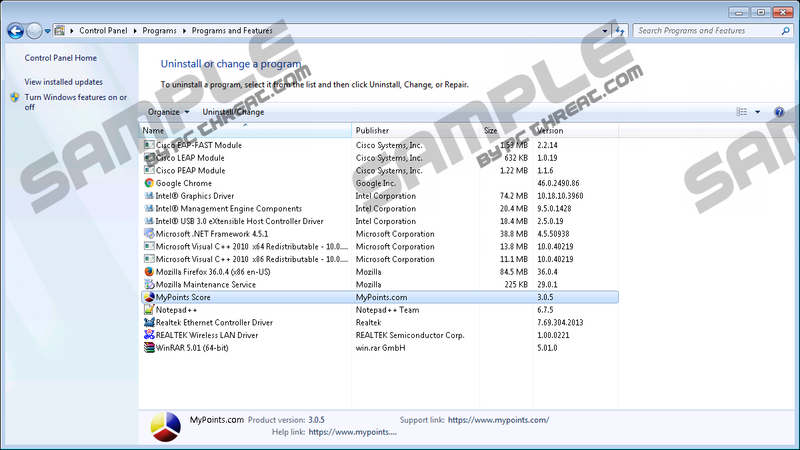 Locate the adware among other extensions and click Remove. Quick & tested solution for MyPoints Score removal.